WHEN: Tuesday November 13, 2018 at 9:00 A.M.
*Per SoCal Edison, sections of the City of Calabasas may be without power at the time of the reopening of the area. • City limits on the west, from the intersection of Westlake Boulevard and Sycamore Canyon Drive - north to the Ventura County and City of Agoura Hills boundaries. • Agoura Road (north and south sides of the road) from Chesebro Road to the west. To accomplish this process, The Los Angeles County Sheriff’s Department is working with our public safety partners to open on-ramps and off-ramps of the Interstate 101 Freeway in the area. The Fire Incident Command continues to monitor the active fire areas, as well as those areas remaining closed due to critical infrastructure concerns or safety hazards. On Thursday, November 8, 2018 at 2:25 p.m. a brush fire ignited in the area of Rocketdyne, south of the City of Simi Valley. This fire has been named the Woolsey Fire, and it has spread into Los Angeles County. The communities of Topanga and Malibu continue to remain closed and evacuation orders are still in place. The Los Angeles County Sheriff’s Department will have a strong presence in the repopulated and evacuated areas for the next several days to ensure the protection of our residents and their property. All other road closures and evacuated areas for the Woolsey Fire remain in effect. 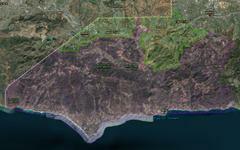 The link below can be used to assist the public in determining if their property is in an area that will be open following the 9:00 a.m. repopulation: http://calfire-forestry.maps.arcgis.com/…/webap…/index.html… Visit the link and enter an address for the Woolsey Fire area in the search field and press enter. You can then scroll out on the map to determine if the indicated area has a red or green background. Red indicates the area is still closed and unsafe to return. Green indicates the area is open for repopulation. In addition to the map, the below written descriptions of the areas to be opened has been provided. NOTES: SAFETY MESSAGE – The public is reminded to stay vigilant on current fire conditions. Please continue to adhere to road closures and any evacuation warnings. A reminder to drive slowly and yield to emergency personnel in the area. There will still be smoke in the respective areas as firefighters continue firefighting operations. If at any time you feel unsafe, please call 911.